This Healthy Protein Waffle Recipe is made with just three healthy ingredients and is crazy delicious. These cottage cheese protein waffles are low calorie, gluten free and super simple to make. You guys know I love my protein waffles, but I’m super excited to share a new healthy protein waffle recipe that doesn’t call for protein powder! That’s right – these waffles contain cottage cheese and egg whites to give them almost 22 grams of protein. 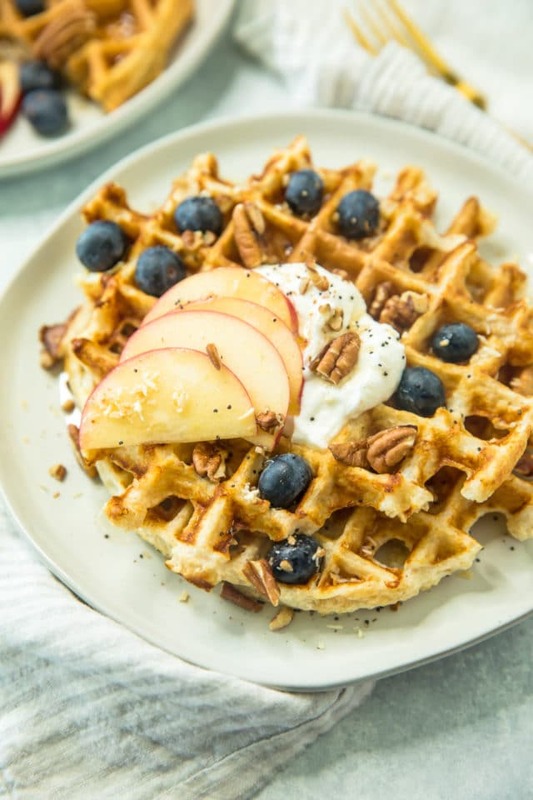 And, I know what you might be thinking… Cottage cheese in a waffle? Yes! These waffles came out so thick, fluffy and absolutely perfect. It’s really no different than using Greek yogurt, just as creamy and just as good. Not a cottage cheese fan? I promise, you can’t even taste it. You gotta trust me on this one! This recipe requires just 10 minutes and 3 ingredients to make. Easy ingredients too! You can always add a little cinnamon and/or vanilla if you want. And, while pretty much any waffle iron will do, I have to say I recently retired my old waffle iron and replaced it with a Belgian-style waffle maker. Friends. I’m in love. It creates perfect, fluffy, massive waffles with little effort. The batter mixes up so easily in your blender or food processor. 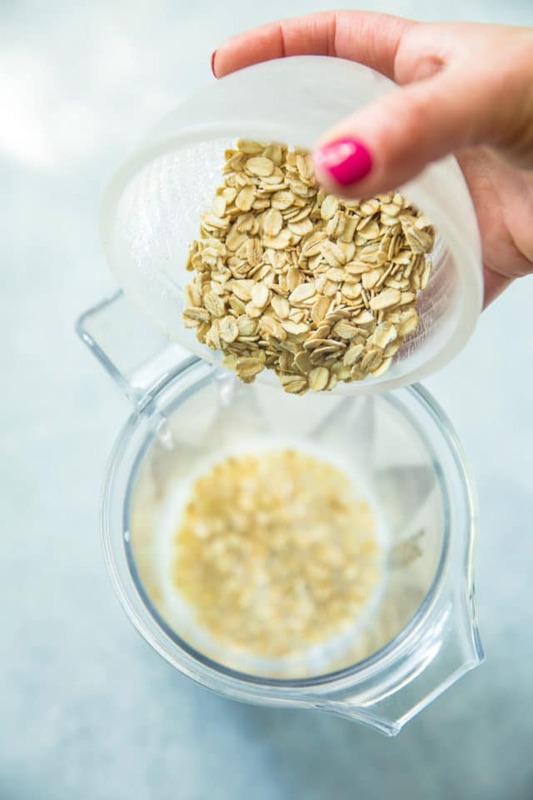 If you don’t have either of these, instead of using rolled oats, use oat flour. Not only is this healthy protein waffle recipe super delicious, it’s also one of the easiest recipes on the blog. Add the three simple ingredients to a blender or food processor. Blend until smooth. I love using a blender because it’s so easy to pour the batter straight onto the waffle iron. It’s SUPER important to spray your heated waffle iron with cooking spray like PAM or the coconut oil cooking spray from Trader Joe’s. These sprays are not completely natural and help keep the waffle from sticking. I’ve tried naturals sprays before and they never work quite as well. My waffle iron is an automatic one with no options to adjust the heat. If yours works differently, you’ll probably want to use the hottest setting and let your waffle cook for approximately 3-5 minutes. Sometimes I leave my waffle in the waffle iron for another minute after it beeps to give my waffle an extra crispiness. While taking pictures of these yummy waffles, I had a little helper and I couldn’t resist a photo! These are officially my new go-to waffle. They’ve received rave reviews from my kiddos (for good reason). 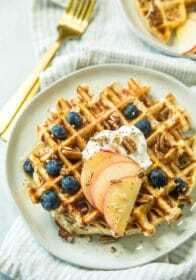 These waffles are delicious with just a little pancake syrup, but they’re irresistible with additional favorite toppings. I love Greek yogurt, chopped pecans and fresh fruit. So good! If you try this recipe, let us know! Leave a comment, rate it, and don’t forget to tag a photo #kimscravings on Instagram. Also, be sure to subscribe to our mailing list to receive more healthy delicious recipes straight to your inbox. Enjoy, friends! 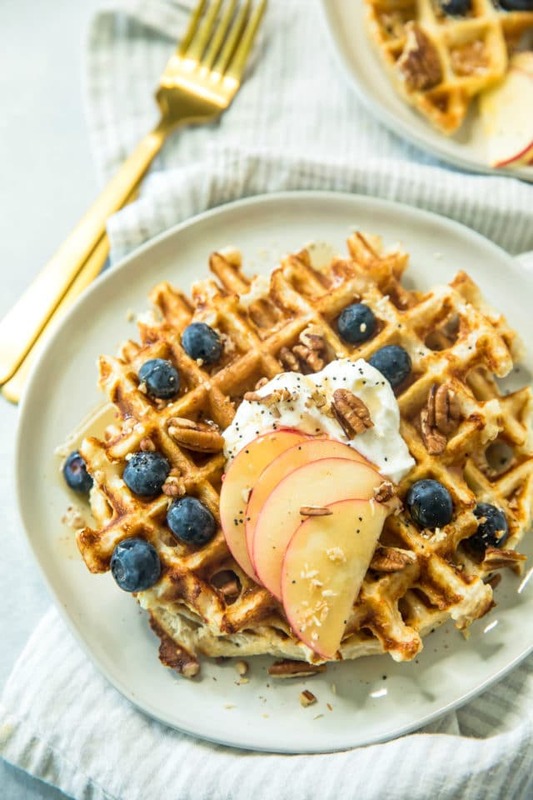 Made with just three healthy ingredients and crazy delicious, you're going to love this cottage cheese protein waffle recipe! Combine all ingredients in a blender. Blend until batter is smooth. Enjoy with your favorite toppings! I love Greek yogurt, pancake syrup, pecans and fresh fruit. *Use gluten-free oats if needed. 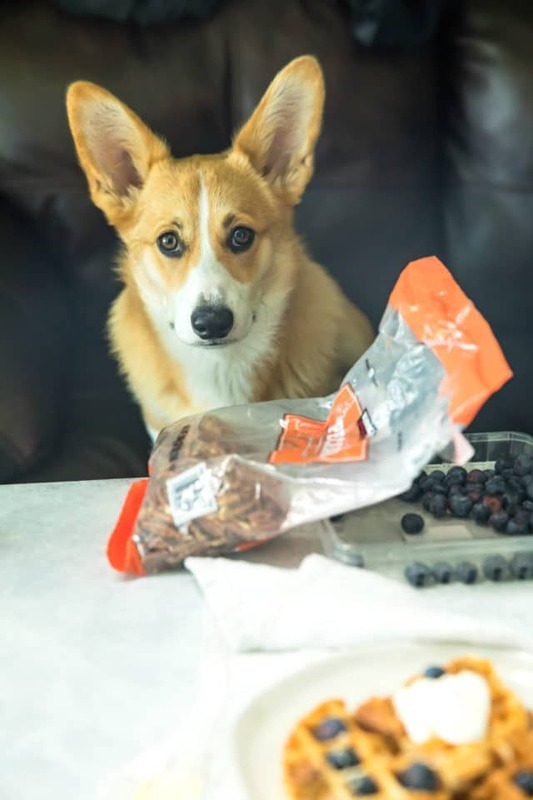 OMG you have a beautiful Corgie!!!!!! I love them!!!!!! So cute!!! 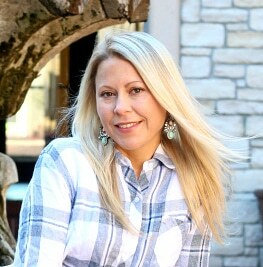 Thank you for your recipes. Thanks so much! We sure love him! He’s such fun! 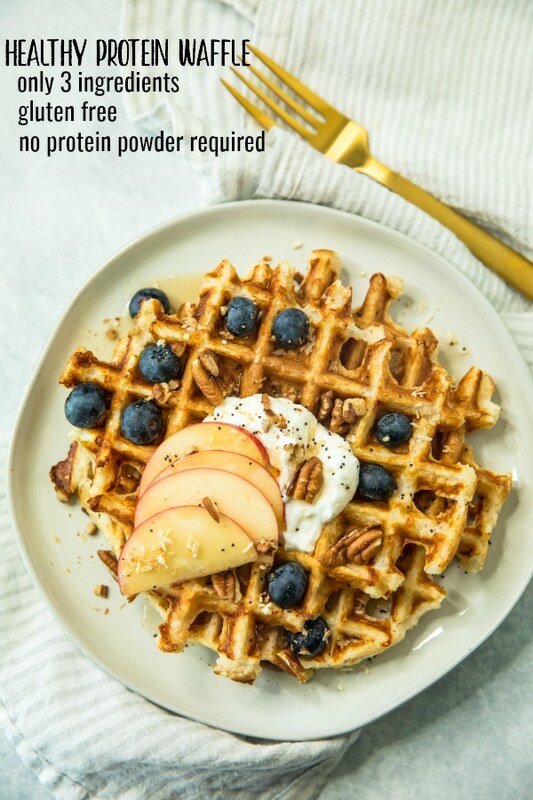 These protein waffles look delicious and I love the simple ingredients. 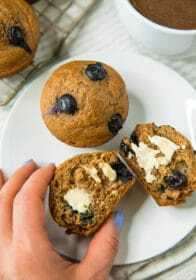 I make protein waffles often, I can’t wait to try this recipe – thanks! 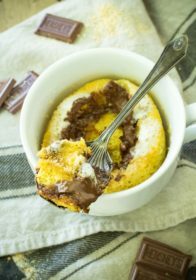 What a fabulous and incredible recipe! 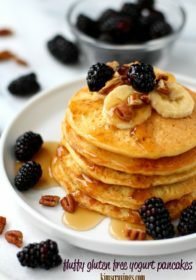 I am sure many people are looking for a high protein breakfast. This is it!! I love to make breakfast for dinner on crazy nights because no one complains! 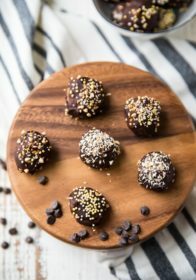 I can’t wait tot ry out this recipe, I love that it is healthy and has protein! 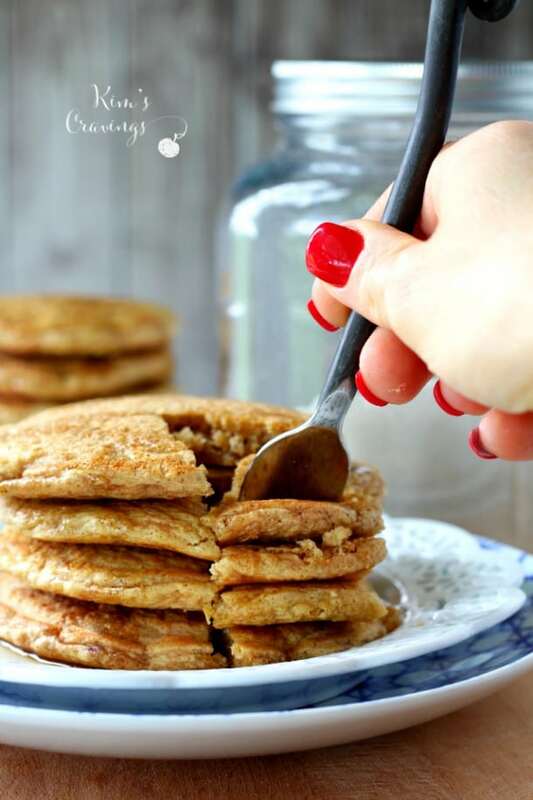 These look perfect for a weekend brunch! I love that you have used something different than protein powder to get a nice dose of protein in there! Love how easy these are! 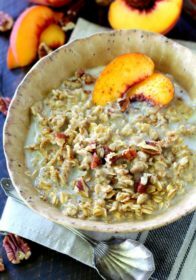 Perfect for weekend brunch and meal prepping for a quick and easy breakfast during the week!